Play a GigaMonster on a rampage and destroying everything in his way! Let's roll the dice to get the best combinations to heal yourself, to attack, to buy special cards or to gain Victory Points. 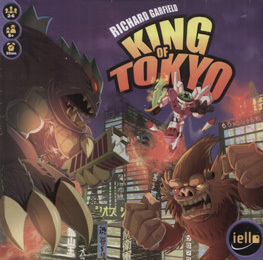 It's up to you to choose the best tactic to become King of Tokyo just in time to get rid of all your opponents in one devastating attack... The first to gain 20 Victory Points... or the last Monster standing... wins the game. One of the first games I played. King of tokyo is a great game for all ages. The aim of the game is to be the kimg of tokyo. You do this by either killing all your opponents or getting to 20 victory points. The components are of very high quality. I have played this with the mother in law and she reallly enjoyed it. I'd definitely recommend anyone to have this game in their collection. An extremely fun little game. The artwork and components are of good quality befitting the style of the game. Essentially a dice game with players trying to get to 20 points first whilst trying to damage the other players, there are various cards which can be purchased which provide one off or permanent effects to you or other players. Players roll the dice upto 3 times keeping or discarding dice, the dice symbols mean you either collect energy (used to buy cards), cause damage, heal or score points. To score points if you have 3 of a number (1, 2 or 3) you score that many points, if you score more than 3 of a number then you gain an extra point for each one. To heal for every Heart token you heal 1 point of damage, unless you are in Tokyo. For every lightning bolt you gain an energy cube which can be spent on cards during your turn and finally Fists represent damaging other players, those outside Tokyo hurt the player inside whilst those inside Tokyo damage all other players. Players in Tokyo can not heal but do gain points for going into or staying in Tokyo, if they are damaged by a player they can elect to leave forcing the other player into Tokyo. This games plays really quickly and is immense fun providing a good open or close to a games evening.